Carl worked at Lakeview Farms in the 1990s. His bothers Denis and Mike and sister Marie also worked at our farm. As any current or past employee of Lakeview Farms can attest, the directions from Farmer Karl can often be lacking in clarity and detail. I recall one Saturday morning in a rushed moment telling a relatively young employee (Carl) to "weed that terrace" then wandering off with no further directions to another part of the farm. Coming back an hour or so later all of us were speechless when we saw that Carl had totally removed all vegetation (including strawberry plants) from that terrace. Carl is now one of my regular strawberry customers so we can look back and laugh about the episode. 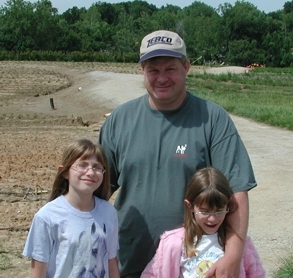 These two young girls are his daughters Carla and Katie visiting our farm to pick strawberries.